Gnocchi with parsnip cream at Veg 388. Kitchen 388 (388 Grand Ave.) is a popular brunch spot in Oakland’s Adams Point neighborhood that’s known for its fried chicken and waffles and for serving about a dozen pounds of bacon on any given Sunday. So it was with a certain sense of mischievousness that chef Kevin Schuder chose the cafe to be the site of his new vegetarian dinner series, which he’s dubbed Veg 388 — a vegetarian pop-up that takes over the normally meat-heavy restaurant five nights a week. 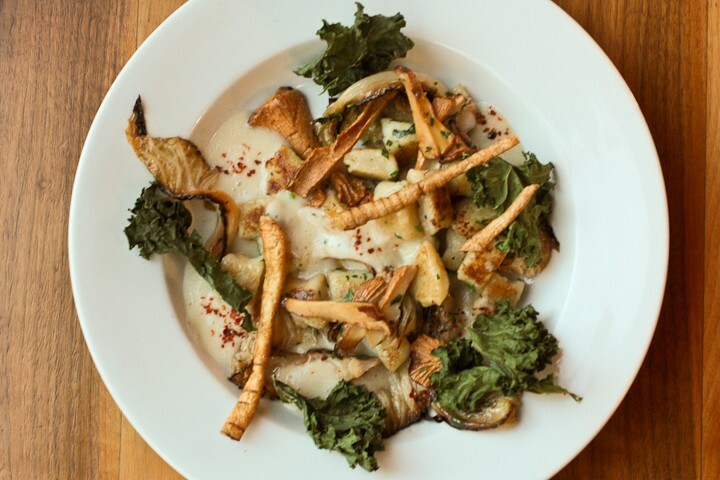 At Veg 388, the seasonal menu of “inventive and inspired vegan and vegetarian cuisine” might feature a salad of koji-marinated carrots or house-made pasta served with a lobster mushroom ragout. Every dish is served vegan by default, though customers can add a poached egg or grated cheese to certain dishes if they want. Most of the time, people wind up sticking with the vegan option, Schuder said. Schuder isn’t vegetarian himself; he’ll eat sustainable seafood and, on occasion, meat. But the chef explained that he cut his teeth working as a line cook at Millennium, San Francisco’s most well-known high-end vegan restaurant. And when it came time to develop his own restaurant, he decided that he wanted to promote some kind of environmentally sustainable idea. And when he looked around at the other vegetarian and vegan food that was out there, Schuder felt that much of it wasn’t very good — or, at the very least, it wasn’t being done in a way with which he could identify. “I guess I do want [the food] to shine on its own merits. People shouldn’t shy away from good produce,” he said. What that means, from a practical standpoint, is that Veg 388 serves significantly fewer beans and soy products — which are traditionally deployed to emulate the taste and texture of meat — than your typical vegan restaurant. (Schuder does, on the other hand, incorporate about five or six different varieties of mushrooms on any given night.) Meanwhile, a foam that Schuder makes with fermented cashews is listed on the menu, simply, as “cashew foam” — not “sour cream,” in quotes. Schuder’s resume is dotted with such prominent San Francisco restaurants as AQ, Izakaya Yuzuki, and, most recently, Bouli Bar. But Schuder said he identifies most with two of the city’s best-known permanent pop-ups, Mission Chinese Food and Pink Zebra — restaurants known for their punk rock, modern edge. According to Schuder, what he shares with the chefs of those establishments is a fine-dining background that he’s decided to apply in a more casual, accessible setting — “to strip away the pomp and circumstance of it.” Like the chefs at those pop-ups, Schuder uses a blend of traditional and modernist cooking techniques. He does a lot of smoking, drying, and fermenting. But he’ll also add xanthan gum to a pasta sauce to make it adhere better to the noodles, and he uses an iSi canister to aerate the aforementioned cashew foam. 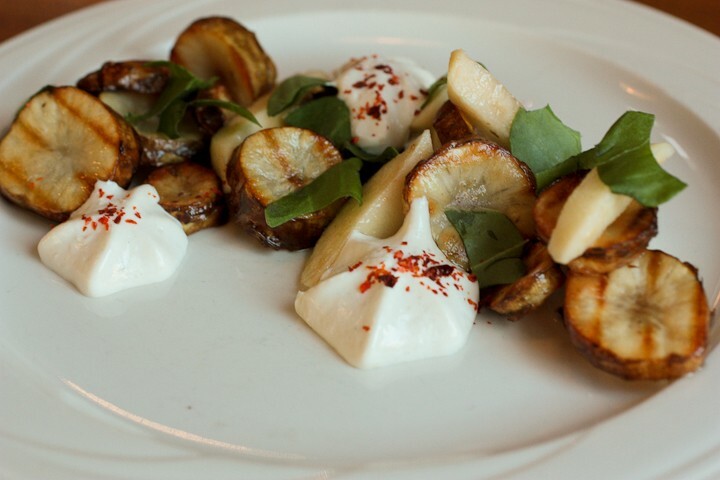 "Like having a campfire in the woods" — sunchoke salad at Veg 388. Veg 388 is now open for dinner from Thursday to Monday, from 6–9 p.m. Schuder also just launched Kitchen 388’s new happy hour program, which isn’t strictly vegetarian, from 4:30–6 p.m. Thursday through Saturday.